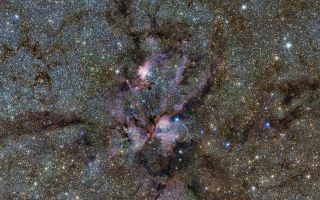 This space wallpaper from ESO’s VISTA telescope reveals a celestial landscape of vast, glowing clouds of gas and tendrils of dust surrounding hot young stars. This infrared view reveals the stellar nursery known as NGC 6357 in a new light. This space wallpaper from ESO’s VISTA telescope reveals a celestial landscape of vast, glowing clouds of gas and tendrils of dust surrounding hot young stars. This infrared view reveals the stellar nursery known as NGC 6357 in a new light. It was taken as part of the VISTA Variables in the Vía Láctea (VVV) survey, which is currently scanning the Milky Way in a bid to map our galaxy’s structure and explain how it formed.